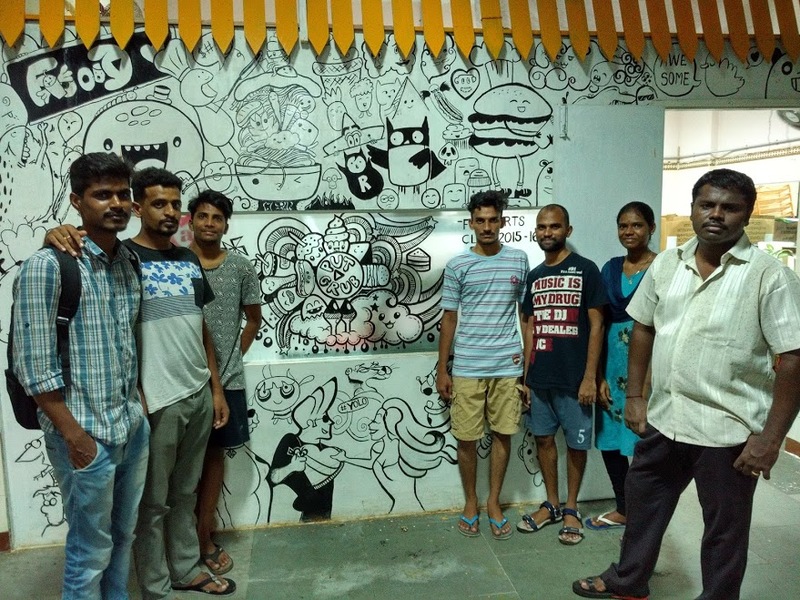 This is the second article in the series where we have interviewed Sandeep Mederametla who dropped out of IIT Madras, started up thrice, came back to campus and is building his tech backed services company in his own style. Sandeep joined hands with Srinvas and Madhu, ex-students from IIT Madras and chose to come back to campus and start PutPeace.com in insti, simply because “which other market can we connect with, the most?” Read on this candid interview to know the team behind the startup which comes to our rescue for last-minute print outs and late hour hunger pangs. The simplicity and depth of these answers exemplify their maturity towards PutPeace.com and life in general. PutPrint is a simple concept based on cloud printing technology and removes the need of carrying a pen drive or hard drive around to get a print out. Students just have to create accounts on our platform to use the resource. A printer is not used most of the time, and it makes sense for a lot of people to co-own it in an appropriate manner. Later, we want to reach a stage where the community itself sets up a resource (printer in this case), and we help them share it with the help of PutPrint platform. It is not just a website which needs to be maintained, but a lot of other stuff like refilling the cartridges, refilling the blank papers, maintaining power supply and internet access etc.are to be taken care of. The services we are choosing does require a lot of on-ground work, but technology helps us rethink and radically change the way we provide these services.Just like how Dropbox started the service of storing documents, we thought we should start printing service. 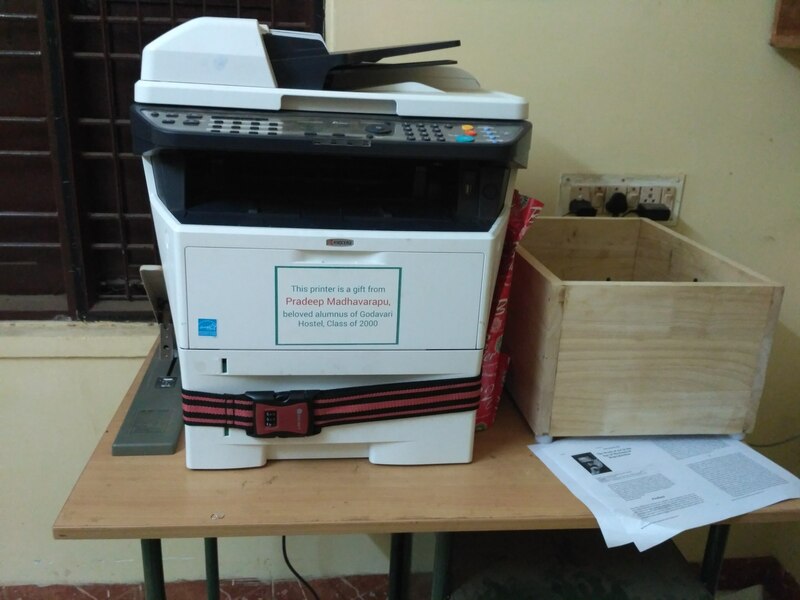 We are right now procuring printers by running a campaign with the help of the IAR office and setting them up at hostels. Maintaining the printers is again our job. Have you thought of integrating backwards to have your own document storage and maintenance software? No, we are planning to integrate dropbox and google drive to putprint starting next semester. We experimented on this when we started, but over time, gravitated towards the printing business. There was another Nirmaan (CFI, IITM) team, Noteshare, which was working on building a Moodle with social features. Is it in pipeline for your product also? No, there are a lot of players in this space, especially the storage and education space. We decided to be service providers, take up one thing and build a profitable business out of it. It took us quite a time to figure that out. What is your expansion plan with respect to Putprint? The last time we met, I talked about gated communities. The good thing is, because we are a technology backed service provider, we need not have our boundaries limited by actual gates. We can take map of a particular area, geo-fence it on the layer above it and direct our customers to the service location. A lot of optimization study needs to be done to cater to a community in the best possible way, so we are planning to create virtual communities and provide this service to them. We plan to work on making this operational over the next year. Right now, we are live in IIT Madras and will soon expand to other institutes like SRM and VIT. These pilots help us to understand how our technology is adopted by the communities we want to serve. We are not going to other cities in any near future, because we are a strong close-knit team which wants to stay together. For us, it’s important that we solve problems using technology, but at the same time, “Put Peace” together to enjoy our journey as entrepreneurs. We don’t believe in taking stress and setting unrealistic growth targets to fool ourselves or our investors (who are just close friends till now), but learn actively from current operations and grow organically. Doesn’t this look like a lot of work with administration offices of these colleges, and later communities ? Yes, we are in constant touch with CMGFS and even converse with the DoST (Dr. Sivakumar) for important issues. Dean IAR (Dr. Nagarajan) at the alumni relations office has been helping us raise funds to set up printers in hostels. We didn’t seek other financial support from the institute yet, maybe we will need it next year. More importantly, we need support in other formats. Our technology is kickass, it’s robust and there is no reason why it cannot exist in all hostels but there are a lot of permissions which we have to take. We have to go to CCW chairman, then go to the hostel warden, then raise funds through IAR office to procure the printers. It will be nice if we get help to make this process easier. Can people put up their own printers which can be used by others? Will this grow into an Airbnb of printers? It can. The technology is designed in such a way but we don’t look at it that way. Our model is this – we adopt communities, understand them thoroughly, and provide them technology backed services, which can be customized to their needs. Yes, it takes a lot of time in achieving the synergy with communities, but once the marriage is done, the barrier to entry for others in that market is really high. We can create newer and newer markets once we understand our communities of customers more deeply. This is like application of ‘shared economy’ concept and taking it to the next level. At the same time, we are not a marketplace of services. We don’t list or curate lists like a lot of other players. Rather, we ask our communities to completely trust us on giving them the best possible service. We source the people, we source the resources, we build the technology, we control our service to the community that we have adopted. We are still in the lab stage currently and it would be very early for us to say what we can become or will become. Our focus is just to enter a couple of communities and build a profitable model with each community. We wanted to start a project, so we started at CFI. Then we wanted to take up a niche market and test our technology, so we started in IIT Madras. After that, we want to build a small business; we have just started making consistent profits through PutPrint in IIT Madras. Now that we have got a grasp of this community, have a team which can survive based on that consistent profit, we will start planning how to scale up. This is a niche market model. Develop technology to serve a very niche market. Scale to all the niche markets available and then think to penetrate even deeper into those markets with newer services. That is the ideal time to see if our solutions can be applied to the mass market and raise venture capital for it. What has been your learning experience from PutPrint till now? We were coders back in college days. Never imagined that we would be roaming on the roads, fixing printers and refilling papers in them, which is as cool as coding to me. We get to talk to a lot of students daily. We made a lot of calculations before starting and quickly realised that all calculations will go wrong. They have to go wrong but then, you are always surviving in a startup. If you are not disappointed after failure, you will see new opportunities which you did not see before and help you pivot. People talk about million dollar companies and hundreds of employees in their startups, but they are too just barely surviving. They are just surviving at a different level; we are surviving at our level and that is the best thing about starting up. Surviving is so cool, people often forget that and chase imaginary goals. What drove you to start PutGrub? We came to campus last August and didn’t have good food for 6 months. We thought – let us start cooking for ourselves, but then thought of opening up the kitchen for everyone. Our experience of staying in institute for 4 years and now made us realize that institute needs a better and social experience of dining out, a place where you can walk into the kitchen, talk to the chefs and delivery guys because they are like you only, the menu keeps changing every week based on what our customers like to eat and what we as owners would like to experiment upon. What challenges do you face and what makes you different from other such platforms? We started 4 months back, but can’t claim that we have cracked it yet. Yes, risk is very high, but since it is a traditional business, there is a lot of scope of disruption. For example, no chef will feel comfortable with the dashboard at first. Chefs will think – Oh where is my customer, why he is not sitting near the kitchen, how will I use my decoration skills etc. Again, as I say, we are technology centric company. We measure each and every single thing in the kitchen. Amount of ingredients in each recipe is measured and documented in a standard operating procedure, which allows us to track the inventory used in a week, and thus helps us plan our inventory for the next week. This allows us to operate very lean and avoid losses which you will see in other restaurants. Our software tracks this usage currently and helps us plan for the next week. It is not making us money right now, but in the longer run, being a technology centric company is going to help us zoom past our competitors. If we are smart about pricing, supply chain, quality and marketing, there is basically no ceiling to profit margins in this business, and that we find to be very lucrative. The biggest disruptions can be seen by the rise of new online restaurants. You can reach a wider market, are not constrained by the physical space and save huge money on real estate and ambiance. We just need a terrace to run a kitchen and thus, technology helps us replace real estate requirements. At the same time, it is important to understand and imbibe the traditional restaurant business. We cannot dismiss it right away, and shove it through the blender of web-technology. We will shortly start taking customer reviews online, 45 minutes after the order has been delivered. How did you hire chefs for PutGrub? How do you hire people in general? We are still learning the process but it is quite nuanced. We went to Puducherry in search of trained chefs. Culturally, they are so different than us. They are highly trained and skilled chefs, have a lot of knowledge about the food industry. None of them went to a college like us and have been working in day jobs to generate income since they were 12 or 13. They started working in cafes as cleaners, moved on to cooking and learnt by observing their seniors closely and working in this field for years. They are definitely very different people, and learning how to empathize with them is a muscle that we are building right now, which is an experience in itself. Slowly, we are learning how to hire chefs. What’s your business model and how does your team work ? We start with hiring them on a temporary contract because we want people who can adapt very quickly to our dashboard. We are asking them to make a huge leap from their salaried job to a job where they are given equity. Most of them find it tough to understand what a startup or equity means, and how these things work. Our chefs get shares on sale. The way we are building our technology allows chefs to move from one kitchen to another using our platform, based on their convenience. Whatever they sell, they get a cut in that. This forces them to think as a business owner themselves while deciding the menu for the next week, constantly keeping them on toes to innovate and work more efficiently. Convincing them is an exercise in itself, but once you understand the dynamics of this profession, you know where to hit the nail. We found that there is a lot of hierarchy among chefs also, and it go from a 2 layered to 5 layered hierarchy. Most of the work is done by the lowest layer of chefs and every dish you eat in a 5 star hotel passes each of these 5 layers to test for taste and quality. We try to rope in people who would like to work in a flat structure, in absence of such hierarchies. We are also making use of online portals like Quickr and babajobs to search for chefs. It is very important to always be aware of the fact that you are in a startup, which can disappear in a very short notice. When you hire someone, you should risk-educate them and let them know that this is most probably going to end nowhere. If they are still joining that means they are cool. It is better to have enterprising people to start with, who can adapt to any role and take up ownership of their work. Later it is fine to hire people with more defined job roles. It is crucial that your core team is built of people who don’t fit anywhere else but in your team. Having complimentary skills is one aspect of choosing co-founders. We have complimentary emotions. If one is serious, the other is cool and that keeps on varying. At the end of the day, building a team is just like any other decision which you have to take while starting up. It is trial and error. So don’t be afraid of trying. As we are a technology backed services company, we are going to hire a lot of people like chefs and procurement guys. Cleaning is another service which requires a lot of human labour so we dream to be a big people company too. Such a setting suits well for our country. We are looking at room cleaning and laundry next. It will be cheap for us to send someone to wash your clothes in the washing machine in the hostel and charge for the same. It makes sense to put existing resources to best utilization and share it within a community with the help of technology. These are just random ideas and we will try them out with experiments. We started PutPrint in Jamuna hostel, learnt, and then scaled up. We first started PutGrub offline, understood our customers, and then came online. Similarly, we will design experiments to quickly learn the basics on the next few services and then shift to a scalable model. Apart from that, you know that Medall provides counseling services to students in institute. It’s quite hilarious that we expect a mentally ill student to go and seek appointment with a doctor. It’s pain. Our system should be designed in such a way that gets the job done, is effective and technology can help us do that. Interaction between a psychiatrist and students can start over chat, and then it can turn to a small phone call when the doctor might say – “hey, why don’t we discuss this in some place like institute stadium or IRCTC”. PutPeace is evolving to become a platform being used by hundreds of students everyday, and once it reaches a critical mass, we can become a marketplace of services under the same umbrella. You name a service, and we can provide it. Amazon and Flipkart are marketplace for the whole country, we are aiming to be marketplace for a community. Call us an online Gurunath, maybe 🙂 . It should be really simple, reduce the decision making which our customers have to do and at the same time, do the work for them. For example, if you want to get a printout, you should not be thinking – who will have a pen drive in the wing? Will the shop be open? Will there be internet connection so that I can download the file there? Will there be a long queue in the shop? Just use PutPrint, make your job simple! Certainty means a lot to customers. It is generally overlooked by startups. Doesn’t it sounds like Amazon’s Mechanical Turks ? That is only for online tasks like simple data analysis, or data entry job. Taskrabbit is closer to our model, and it is huge in the US. Urbanclap and similar players are trying to ape them in India, but as I explained earlier, we are not listing service providers; we are providing the best service ourselves. We can do it better than individual service providers because we are backed by technology and can follow standardized rules and procedures to maintain quality. It is not a free market where customers make decisions. We become one with the community that we adopt, and become ubiquitous in their lives through the various services that we provide. We will gradually build the trust that they need not look beyond our website for any better option. I have been thoroughly enjoying my work. I must start with saying that because it’s the most important thing for me. I wanted to build a company I am happy about, and not be guided by money. I dropped out of IIT Madras and started Desto Designers, a web design and development house at 19. Within six months from launch we scaled out to 25 student employees and worked on 15 major projects involving corporate clients. The core team I built back then is still running it at www.desto.in. Next, I founded Chance at Microsoft Ventures, which aims to change the way Followers interact with their Influencers, globally. We were funded by Venture Hive, Miami. Next, I went and joint Moonraft, a startup by our alumnus which develops next generation human computer interaction interfaces. I worked on a lot of exciting projects there, and learnt a great deal from its founder and CEO Soma while I worked there. For me, in every company, I got to do a new job. I don’t have any static profession or a skill set. Tomorrow I will start cleaning rooms in hostels and managing on-ground people, and that will teach a new thing to me. I like to play a lot of roles, and that is the attraction which a job-profile of an entrepreneur holds for me. Have you raised funds till now? Soma has given me some money to startup. It’s a very little amount and rightly so. The idea is to learn how to be profitable at unit scale before scaling up. Apart from that, we have got money from our close friends in return for stakes. But they have invested because they know us. They have invested in people. Not the ideas. We have full freedom to work on our idea in the way we want. They do not wish to control it in any way. We strongly recommend other startups in IIT M to raise funds from their friends due to this benefit. If your decision proves to be wrong or you fail sometimes, the worst thing that can happen is that you will feel a bit shy at parties in front of them but they still trust in you and your entrepreneurial skills. Who guides you? Where do you learn from? Situations (before breaking out into a hearty chuckle).You will hardly find a mentor who will stick through and tell you what to do at every step. You have to take decisions and see most of them fail. If you decide to own the situation, take responsibility and say –“I will still do this”, you learn a lot. The struggle to solve the problem and come on top of every situation teaches you much more than an MBA. I have not done an MBA, but I needn’t do one to claim so. We discuss a lot among ourselves and I give a call to Soma to discuss what is happening on my end regularly. So, a support ecosystem is very much required, but it can only take you as far as you are ready to go. How cool are your parents with this lifestyle? They are cool half of the times. They keep having mood swings. We take a Gaussian distribution between blackmailing them and loving them deeply to make it work. It’s like having a girlfriend, you fight one day but you still love her. Do you plan to get incubated at the incubation cell? IIT M also offers an MS in entrepreneurship program for alumni who want to defer placements to startup. Are you considering it? It might help a few people, but we don’t want. Our heart and mind don’t align with such things. We try to launch something in the market, test it out, learn from it, from the people and from situations. That is how we are programmed. When I was in college, funding at incubation cell was not promised. Right now, if they are providing seed fund, it is a good thing for startups but there is already so much money to be raised in the market out there. If you want money, somebody sitting somewhere is waiting to give you money. That has never been a bottleneck for startups. Incubation cell itself is a business, and they have a lot of competition in terms of angels and VCs. Our alumni themselves are funding us. So, IC is not the only option in the market. If you have to choose between starting up and doing an MBA, or joining a good startup and doing an MBA, choose the former. Heck, if you have to choose between learning to code and doing an MBA, choose the former. No, but seriously, we see most of our batchmates graduating from IIMs and they claim life is a bed of roses from there. I suspect some bias over there. Though I have the same bias, I stick to my side proudly. I am not fighting against MBAs but this is better anyday (after failing an attempt at euphemism). I would also urge students to think this way: right now, the opportunity cost of starting up is very low. You can easily raise funds just after graduating from the college and you are not yet addicted to a big fat salary check getting deposited at the end of every month. At the same time, raising money is not a barometer for the success of your startup. You might as well do a job to do similarly well for yourself. If an investor pays you a salary but is calling all the shots, you are firstly valued lesser than you should be, and you lose autonomy too. It is better to balance life between these two options. Finally, it is important for juniors to realize which bunch of seniors to listen to. They should develop their own priorities and not allow overhyped fads cloud their vision and interests. Everyone has to find their own path, so I urge them to spend time with themselves, trying to understand what they want to do. There is a lot of hype around certain things in insti, because of which we lose potentially good entrepreneurs. This all fad culture has to go and entrepreneurs only have to set an example by rejecting them. Finally, it boils down to people who are original, who take ownership of their ideas, work and decisions, and finally stick to them.